A sorceress of ancient Britain, she is best known for several different pivotal things, with the one character being put to use in so many different stories that the identity became separated. Also, despite how similar her name can be to Evian, the fertile spring in that French town was not discovered until many centuries later, so those etymology rumors are false. She is also not to be mistaken with the character Evaine, who she stole children from. However, sometimes she is also Morgan le Fay. 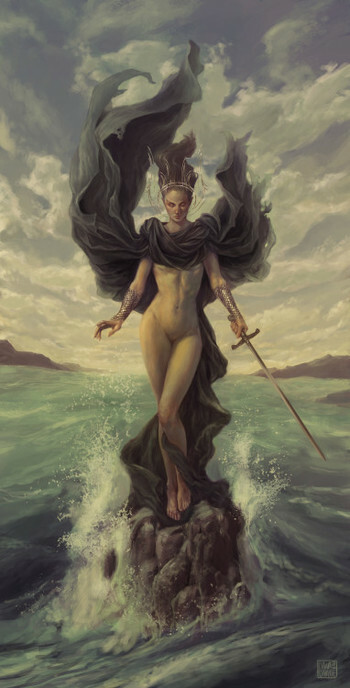 One of the earliest mentions of the Lady of the Lake is how she spirited away Lancelot from his family as a water fairy, raising him in the Lake in the Land of Maidens, which has parallels with Themyscira of Classical Mythology, and not the only connection. She is stated to have her beguiling powers over Merlin granted from the goddess Diana. The island is also similar to Avalon, too, though. Later stories expand on this, telling how when Lancelot was an infant his parents' kingdom of Benwick was being pillaged and he was left on the ground whilst his mother Elaine (who is not one of the Elaine's he sleeps with) was healing his father, and the Lady of the Lake swooped in to carry him away. Additionally, Evaine's children were kidnapped by a knight doing the pillaging and then spirited them (Lionel and one of the Bors') to this mystical land, too. For a few years, Elaine is miserable and has joined a nunnery with her sister Evaine, but they are given a vision of their childrens' happy childhoods. It is assumed that the Lady of the Lake was on the side of those doing the pillaging, or may have initiated it with a desire for children. This is also why Lancelot's surname is "du Lac", and it is the Lady who sends him to Camelot. In some French Chivalric Romance poetry, the Lady of the Lake (here Viviane) is like a godmother to Lancelot and also has a backstory of her deceit of Merlin. She plays Merlin and says she'll trade love for his secrets, though he foresees that when she's got what she wants she will trap him in either tree or stone; he has to do it, though, and does end up trapped. Another French cycle has a similar story of Ninianne, but also adds the part about her giving Excalibur to Arthur. These are clearly the same person, but transliterated in Le Morte D Arthur as the Lady of the Lake and Nimue, separate characters, with it being the first one who gives Arthur the sword, instead. This Lady is also beheaded by Sir Balin. Both are expanded upon in folders below. Other stories of the Lady of the Lake include the Franz Schubert pieces in the style of an early Concept Album, of which "Ellen's gesang III" is best known now as the "Ave Maria". It is based on a poem by Walter Scott that sets the romance in Scotland. Alfred, Lord Tennyson also adopted a version, splitting the character again into the evil Viviane and virtuous Lady of the Lake. This is the style often repeated in stories borrowing the characters, several of which are listed on this page. See also the tropes Enigmatic Empowering Entity, which used to be known as The Lady of the Lake and still has the alt title Empowering Lake Lady, Excalibur, and Merlin and Nimue. a.k.a. the French Lady of the Lake, based off early Viviane in the Lancelot-Grail cycle but called Nimue by Thomas Malory. The Nimue incarnation of the Lady of the Lake is possibly the most interesting, with many more works featuring her and much more academia written on her. Her first appearance in L'Morte d'Arthur is at Arthur's wedding and at the time when the Chivalric code is being changed, which is blatant symbolism that she's going to bring change in the status quo, and one to do with love. She's kind of a bonus background character for a while in various stories until she gets her own, several times she does provide aid for Arthur and the knights on their various adventures before popping back out. It's interpreted that Malory also uses her popping-in-and-out appearances to make it clear that the character is rejecting the fame that her role could have (due to the stories exceeding in popularity), something parodied magnificently in Spamalot. Regarding taking Lancelot as a child, this is sometimes justified in that she knew the pillaging soldiers wouldn't be very kind to him and she could, but also made worse because in this cycle she is often Queen of Sicily who controls the court, so it would have been her decision to sack Benwick in the first place. Obviously, because of the whole husband thing in these cycles she takes them back to court rather than the Land of Maidens, but still has the lake so it all works out. However, she is best known for the story of Merlin and Nimue. In this, after saving their asses several times she gets to become student under the great wizard Merlin, and is an eager student. However, she is enchanting in the beautiful and interesting sense (sometimes deliberately, sometimes not) and Merlin comes to love her. In some versions, Nimue does return this affection but still manipulates Merlin to "steal" all his knowledge; in others, she does not return the affection and either coldly uses it against him or just wants the old creep to leave her alone. 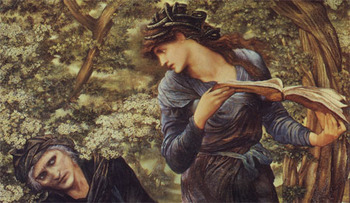 Merlin foresees an event in which she traps him in a stone/tree/cave after she has had him tell her everything, and resigns himself to this as a combination of knowing that what he sees must happen and being too enamored to even come up with a way to set it up so that while the vision will happen he can still escape or trick Nimue into thinking she's had him reveal all before he has. Sometimes he dies, sometimes he becomes part of nature. She then takes Merlin's place as the magical person at King Arthur's court, and lives happily ever after with Pelleas (at least for a short while). In most of these stories she is among the queens who delivers Arthur to Avalon after he is mortally wounded. 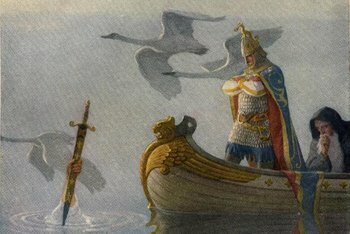 She then reclaims Excalibur when Bedivere throws it into the Lake, sometimes being depicted as returning to her place as before she had given Arthur Excalibur, waiting like him until it can be wielded once more. She has various other character traits, which are all positive. She is also often a divine emergency sensor, because whenever Arthur is in trouble, she'll get to him with the help he needs. Like Dora's backpack, but a water fairy goddess queen. Adaptational Nice Guy: In one source, Suite du Merlin, the Lady of the Lake traps Merlin in tomb so that he will rot and die just For the Evulz — in this cycle, her reasoning is that he won't leave her alone. Malory is the most sympathetic, with other versions still giving her more than a little want to harm him. In general, Malory seems to have taken all of the nicest aspects of the character and put them together. Bad Powers, Bad People: Some earlier versions of the story have Nimue/Viviane/the Lady as explicitly evil. The Chooser of The One: She picks Arthur. Depending on the Author: According to the Vulgate, she's the one who locked Merlin away. For her, Vivian's allure over Merlin is powered by Diana's enchantment. By her, Nimue often steps in to protect Arthur, either physically, sending a maid, or with magic. Energy Absorption: Where part of the spell, either real or just of love, is that whatever Merlin teaches her she "steals" — him giving her the knowledge is literally giving, not duplicating, so he loses it. Often the caveat is that he must be willing, so it's more like Energy Donation. Extranormal Prison: Whatever thing that Nimue traps Merlin in. Foreshadowing: Malory goes hard on this; her introduction is at a wedding and a time of change. So her story will be about love and change. God Guise: Her subjects see her as one, because she is a fairy and Queen of Sicily. Identically Powered Team: The aim with Merlin and Nimue, though obviously backfires when they are no longer a team, and most of the time not identically powered by that point, either — though both have identical power potential, why they were paired up. The Kindnapper: Takes Lancelot from Elaine of Benwick and raises him as her own. Latin Lover: Sometimes is explicitly Sicilian. The Man Behind the Man: Not in a villainous way, she just manages to secretly manipulate her husband and other members of his court so that all the decisions are to her liking. Mage Killer: Can defeat Merlin. Merlin and Nimue: The story. Power Copying: What the final enchantment on Merlin is. Shipper on Deck: For Lancelot and Guinevere. Undying Loyalty: She is married to Pelleas (not The Fisher King), and her loyalty to him is sometimes shown as one reason why Merlin needs to learn to back off. a.k.a. the English Lady of the Lake, based off Ninianne in the Post-Vulgate cycle but known only as the Lady of the Lake by Thomas Malory. This Post-Vulgate Lady of the Lake started the image of holding Excalibur above her head out of the water, and she makes Arthur owe her a favour if he takes it. When she comes to collect it, she asks Arthur to behead Balin because he killed her brother. Arthur says no, he'll do something else, and she asks for him to behead a certain maiden, sometimes cited as Guinevere but typically a girl from Avalon who accidentally provides Balin with a cursed sword, because the maiden caused her father's death. Balin hears this and reconciles this story with one from a woman who had his own mother put to court, swinging the cursed sword and beheading the Lady. He tries to justify this, but Arthur doesn't really care for the story, and it's especially feeble since some of her more damning acts had already been transplanted to the girl from Avalon. Balin becomes banished (again), but is reinstated when Merlin explains that the girl from Avalon is actually a French princess who enlisted the help of Lily of Avalon to enact a cosmic revenge (which ultimately becomes getting Balin to kill Balan, not that she cares for the details). Though this doesn't seem to justify killing a completely unrelated woman, Merlin and Arthur agree that since the sword is cursed then Balin couldn't help it. There may also be some reasoning related to Excalibur that doesn't seem to have been passed down very well, but the sword is also cause for dispute between the Lady and Balin. Canon Discontinuity: The part where she killed her husband to be with another guy (sometimes his brother), and then that guy killed her for being a murderer was given to a different lady in a different lake in France after a while, though the bones of that story are still in the Sir Balin story. Enigmatic Empowering Entity: Gave Arthur Excalibur, and remains a mystery beyond that. Evil All Along: If Sir Balin is to be believed. At the very least, she specifically gave Arthur Excalibur so he'd kill a couple of people for her. Feuding Families: Her's and Balin's. Off with His Head! : Wanted Sir Balin's head (and/or that of a certain maiden at court), lost her own instead. Til Murder Do Us Part: Killed her lover or had her lover killed because she wanted to be with someone else. This story may have been ret-conned out, though, and given to the maiden described above. You Owe Me: Gave Arthur Excalibur in exchange for a favor. As it turned out, that favor was to kill Sir Balin, (whom she blamed for the death of her brother), or a certain damsel, (whom she blamed for the death of her father). Sir Balin expressed his firm disagreement, and claimed afterward that the Lady had caused his mother to burn to death and ruined many good men's lives. The Seven Deadly Sins: Vivian is a minor antagonist who is obsessed with an evil Holy Knight and so works with the Big Bad to help his cause, but is prevented by her former mentor, a female Merlin, who later enchants her so that she will not return to the Holy Knights. DC Comics has the characters as the sisters Vivienne the Lady of the Lake and Nimue Madame Xanadu (and Morgaine le Fey). Excalibur: When Arthur becomes angry and prideful and uses these emotions and Excalibur to lash out, he breaks the sword. The Lady of the Lake is in benevolent goddess role, though, and fixes it for him. King Arthur: Legend of the Sword: The Lady of the Lake (Jacqui Ainsley) is shown to have bound Excalibur to Arthur's bloodline after Merlin used it to destroy Mage Tower. When Arthur throws the sword into the Lake she catches it and then pulls him in to show him the Bad Future he's creating by not accepting it and makes him take it to defeat Vortigern. "Listen, strange women lying in ponds distributing swords is no basis for a system of government! Supreme executive power derives from a mandate from the masses, not from some farcical aquatic ceremony! [...] You can't expect to wield supreme executive power just because some watery tart threw a sword at you! [...] If I went 'round sayin' I was Emperor, just because some moistened bint lobbed a scimitar at me, they'd put me away!" Avalon High: Ellie thinks she is the reincarnation of the Lady of Shalott (don't get started on who she is, but she isn't the Lady of the Lake) — Ellie is though. Cold Cereal: Nimue has the epithet The Lady of the Lake, and serves as the book's Big Bad. Lady of Avalon: Most of the characters can be the Lady of the Lake in this one, but it's also implied to be the same character reincarnating as the Nth Lady of Avalon (standing in for the Lake). First we have Caillean, who misted Avalon so isn't much like the Lady of the Lake just yet; second is Dierna, who is enchanting and takes on the evil Nimue role as a politician; last is Viviane, who instead becomes the first of the Grail Kings. So it's trying to squish in all the mythos. The Last Enchantment: The story of Merlin and in this version Niniane, where she comes to him as an apprentice disguised as a boy. Like in other romances of this ilk, they form a close bond and when her gender is revealed they let themselves fall in love with the other despite many years' age difference, and continues to teach her his skills and doesn't mind when he seems to be losing them himself, nor is she aware it's happening until his body physically deteriorates and he falls into a coma. She thinks he's dead and puts him in a tomb, where he wakes up and escapes, tells Arthur he's alive but to pit Niniane in his job and help her find a better love, retiring to the cave. The Mists of Avalon treats the role of the Lady of the Lake like a The Nth Doctor kind of deal, where it's a passed-on mantle but nobody seems to get chosen for it. Vivian, Niniane, Morgan, and Nimue, among others, are all the Lady at different points but it is Nimue who has been tasked with luring the druid known as Merlin (a similar title) to his death, but falls for him and drowns herself. The Once and Future King, where she is a water nymph that Merlin falls in love with. The Realm Of Albion: The character Cordelia ends up being made Lady of the Lake, and it is revealed that a long time ago Excalibur was handed off to the ancestors of the current Lady of the Lake and it gets handed down. Charmed: In one episode, the Lady of the Lake manages to call the sisters through a clogged sink; they arrive just in time to see her killed by a demon. Piper is able to pull Excalibur From The Stone, making her believe that she is The Chosen One; in actuality it's her son, Wyatt, and Piper is supposed to guard the sword for him as the new Lady of the Lake. Merlin (1998): The Lady of the Lake (Miranda Richardson) is the sister of Queen Mab and a fey, with Nimue (Isabella Rossellini) being a regular princess/duchess that Merlin tries to ask out. Merlin (2008): Nimueh (Michelle Ryan) is a shapeshifter and evil sorceress who is trying to kill Arthur by many means, while posing as several damsels. Conversely, the Lady of the Lake role is better applied to a good sorceress called Freya (Laura Donnelly). She dies after expressing kindness to Merlin, and he makes a death promise to her. She returns as a water spirit and later gives Excalibur to Merlin when he needs to provide Arthur with a superior weapon. At the end of the show, she is there to take back the sword. Once Upon a Time features Nimue (Caroline Ford) in a few merged mythology plot points. Initially, she is running away from Vortigern's rule when she meets and falls in love with Merlin. As he is immortal, she drinks from the Holy Grail to be able to be with him. Then she manages to kill Vortigern, but this turns her good magic dark and she becomes evil, breaking Excalibur — Merlin uses some of the old magic within it to save her. 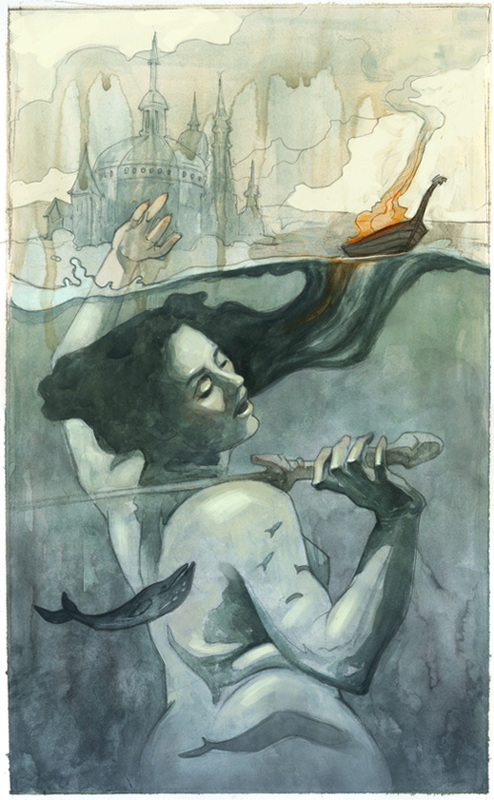 Two other versions of the Lady of the Lake are mentioned, Lancelot's mother (only briefly), and also Prince Charming's mother Ruth (Gabrielle Rose), who is featured in the episode titled "The Lady of the Lake" and suggested to be another form of the Lady of the Lake (her lake being Lake Nostros), or perhaps the Siren that was in the lake who had been previously killed and who is revealed in this episode to be necessary to maintain the lake. Warhammer: The Lady of the Lake is a major character in Warhammer Bretonnia (see her on that page), where she is worshipped as a god in a religion implied to be designed by Wood Elves. She is a literal goddess, too. Spamalot: The Lady of the Lake (orig. Sara Ramirez) is a Large Ham who helps the knights on their quest, wants more stage time, and can sing like she's... the Lady of the Lake on Broadway! This character is an intelligent and loving parody to the Vulgate one but more original-flavour and without Merlin getting in the way. She's also Guinevere. She also has her own cheerleaders. Sonic Storybook Series has both the Lady of the Lake and Nimue, but both are hero characters. Arthur Vs The Druids Vs The Grail: A parody, in which Lancelot defeats Mordred, but Arthur is mortally wounded by the Druid King and dies, requesting Lancelot to cast Excalibur into the Lady of the Lake's pool. Lancelot makes it to the pool, but the Lady of the Lake had gone to a Magic People's convention. Consumed by power, Lancelot realizes that without the Lady of the Lake he can become king with Excalibur, but he clumsily falls into the pool and drowns, leaving Excalibur on the land. Blazing Dragons: The Lady of the Lake is a human-looking nymph, which is odd in hindsight when it's later revealed that one of the dragons is her son. However, he could easily have been adopted. Evil Con Carne: The episode "Hector, King of the Britons" has the Lady of the Lake appear to give Hector three tests when he tries to take Excalibur from her. G.I. Joe: A Real American Hero: One episode involves Cobra swordsman Storm Shadow finding Excalibur and causing havoc with it; when the sword is finally dropped back into the water, the Lady's hand reaches out to reclaim it. Gargoyles: A member of the Third Race, she comes out of an artificial lake in the Brooklyn Botanical Gardens when King Arthur and Griff are in New York, and gives Arthur some tasks to retrieve Excalibur. The fact that she took the sword out of England is presented as a troubling mystery. Word of God says that Nimue also exists in this universe, but is a separate person. Celebrity Resemblance: At least one depiction ◊ has her looking eerily like Katie McGrath, which may be unfortunate news for anyone who's watched Merlin. Or maybe two ◊, and others that aren't so clear. Composite Character: In Spamalot, she is also Guinevere. Decomposite Character: Almost certainly started out as one character, but got split into three mutually-incompatible ones over the years. Many adaptations make it a title that is passed down to various women. Enigmatic Empowering Entity: As the Lady of the Lake. Fairy Godmother: To Lancelot in some stories. Hot Witch: She got Merlin's blood going, anyway. Kick the Dog: Fell in love with Sir Pelleas, who himself was deeply, deeply, creepily in love with the thoroughly uninterested maiden Ettard. Nimue got around this by casting a spell that turned all Pelleas' love for Ettard into hatred, and all Ettard's hatred for Pelleas into love. Then she snatched Pelleas up and poor Ettard died of despair. The Red Baron: The Lady of the Lake No, not the one who gave Arthur Excalibur, but she was one of her maidservants and later became Arthur's chief advisor. Merlin and Nimue: Merlin's affair with his student Nimue is the Trope Namer, obviously. One-Gender Race: The Water Fairies. Our Fairies Are Different: Is more or less a normal woman, who lives in a lake. Our Mermaids Are Different: As above, beyond the magic and lake thing, your average fair lady of the time. Stay in the Kitchen: Gender Flipped. Rarely let Pelleas out to adventure, and apparently saved his life by keeping him out of the final battle. Shipper on Deck: Was apparently one for Lancelot/Guinevere. Spell My Name with an "S": Nyneve, Nimue, Niniane, Vivian. It's suggested the multiple spellings were in part due to later copyists and authors misreading medieval handwriting. The Trickster: Some versions have her take on a role like Ursula, making use of her multiple names/identities to have, say, Vivian appear at court one day with an evil motive.